Bonjour, and welcome one and all! 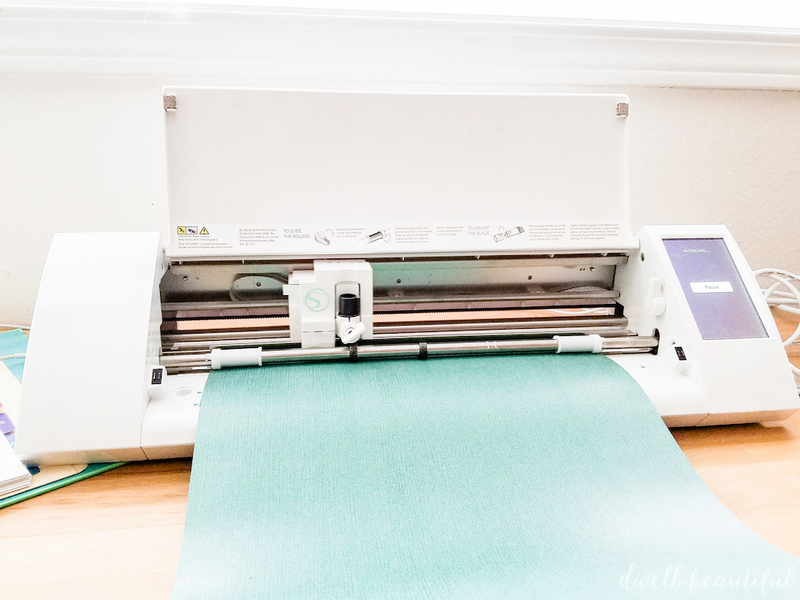 It’s #monthlyDIYchallenge day and I’m SO excited about this month’s project! In case you’re new to the challenge, here’s the general idea: on the 2nd Wednesday of each month, me and my fantastically creative bloggy pals and I create something based on a common theme and/or material. Sometimes we work with brands and sponsors, other times we don’t. Here are some of our recent challenge project materials: plumbing pieces, air dry clay, leather, Mod Podge, Sharpies, reclaimed wood, felt, and chalkboard paint! 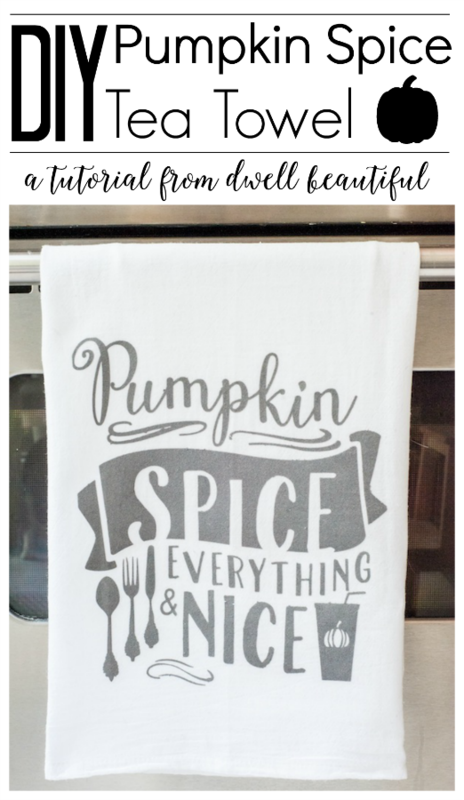 This month the material was white pillowcases and I’m super stoked about my project! 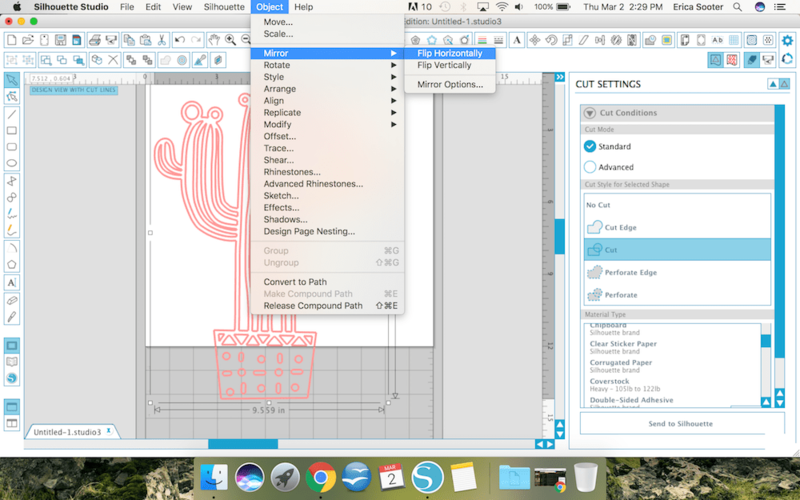 Y’all may or may not have noticed, but cacti are having a moment right now in the design world. 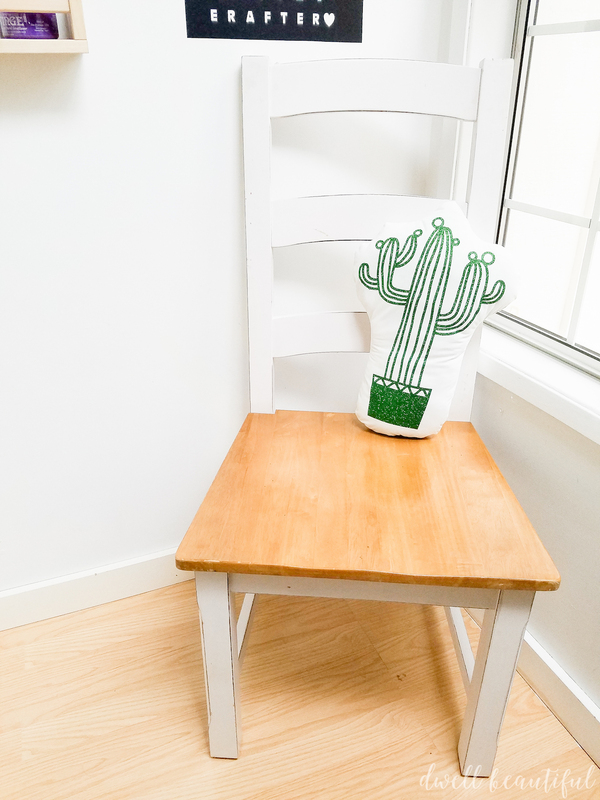 Whether they’re real or faux, printed or crafted, you’re likely to see a cactus or two in every design catalog! 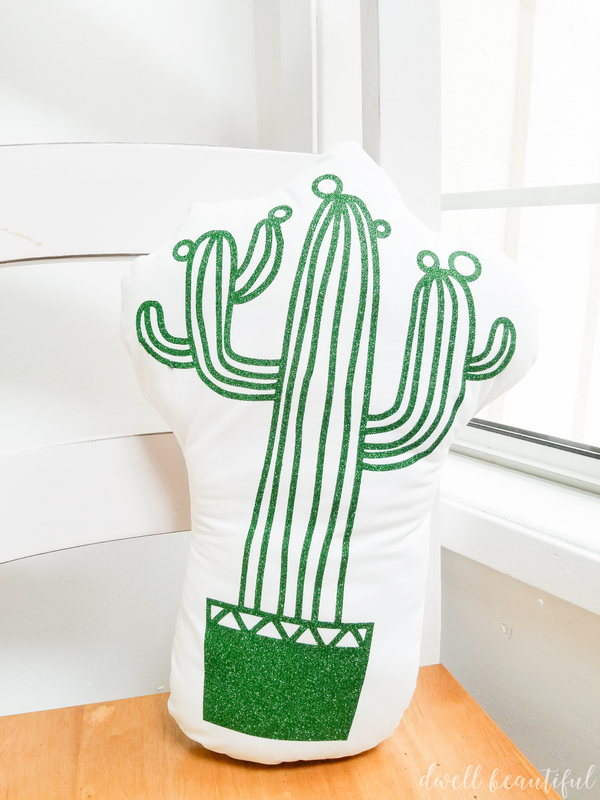 I decided to jump into this fun and funky trend by making my very own DIY cactus pillow out of an old pillowcase I had lying around. Check out the tutorial below! 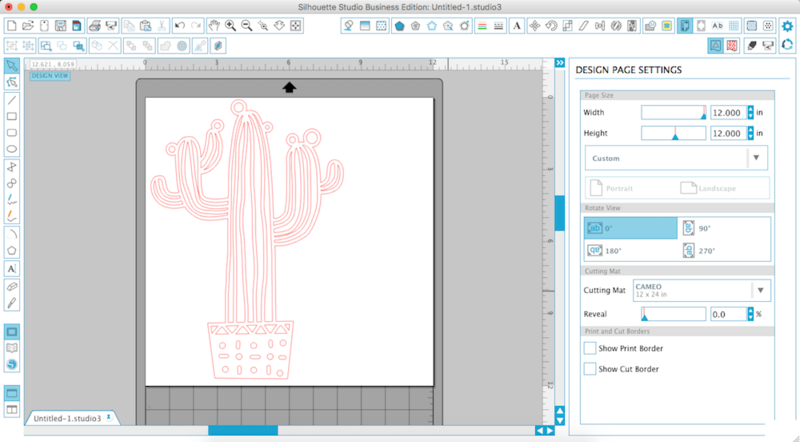 Download this adorably cute and trendy cactus design from the Silhouette Design Store. Open it up in your software and size it to fit your desired throw pillow size. Mine ended up being around 13 inches or so long and 8 ish wide. (Pro tip – make sure your white page size is as big as your image – if your design goes past the white page then it won’t get cut when you send it to the machine… I learned this lesson the hard way). Make sure you mirror your image when working with heat transfer material. In this case it doesn’t particularly matter since there aren’t any words, but it’s just good to be in the habit. To mirror, select ‘object’ from the menu, ‘mirror’, then ‘flip horizontally’. In the Cut Menu, set you material to ‘flocked’ or ‘glitter’ heat transfer material, and change your blade to a depth of 3. Hit ‘Send to Silhouette’ and watch it cut away! 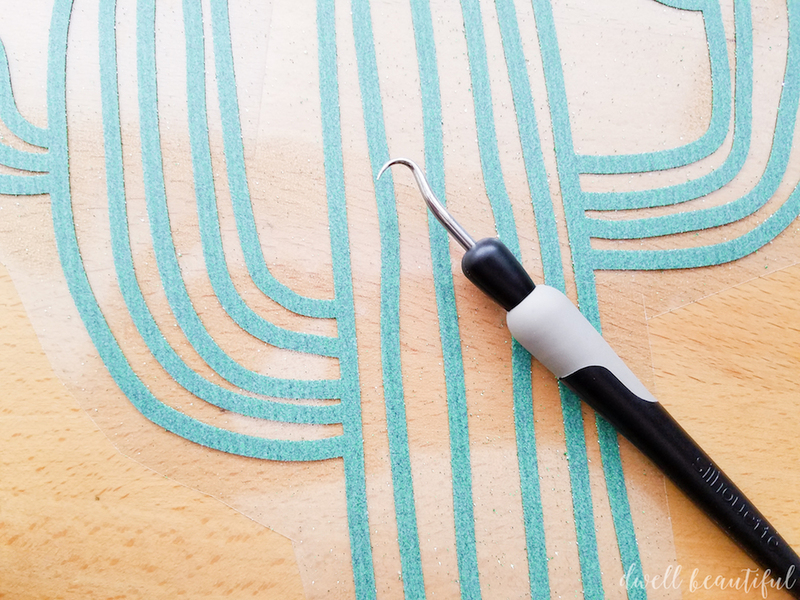 Weed your cactus design with a hook tool and pull away all the material that isn’t a part of your design. 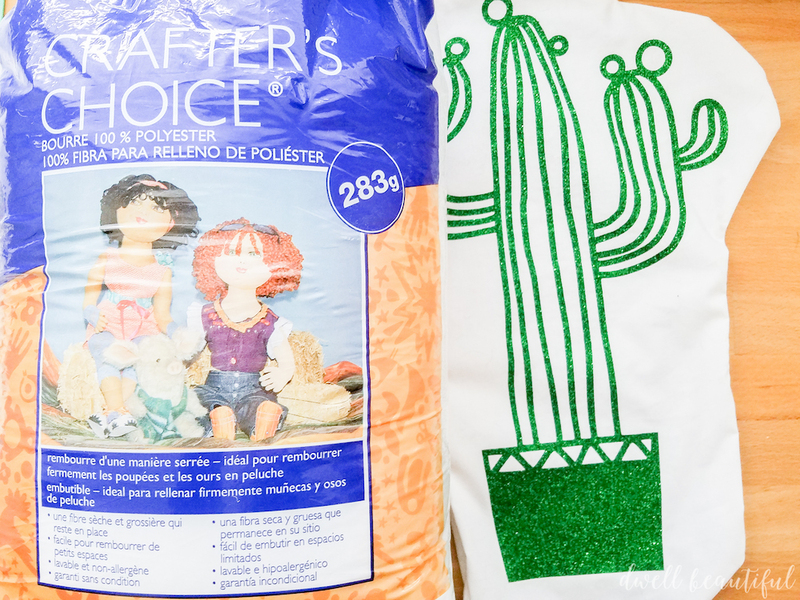 Place your cactus design in the middle of your white pillowcase, place an old hand towel or scrap piece of fabric and iron firmly until the cactus sticks to the pillowcase. 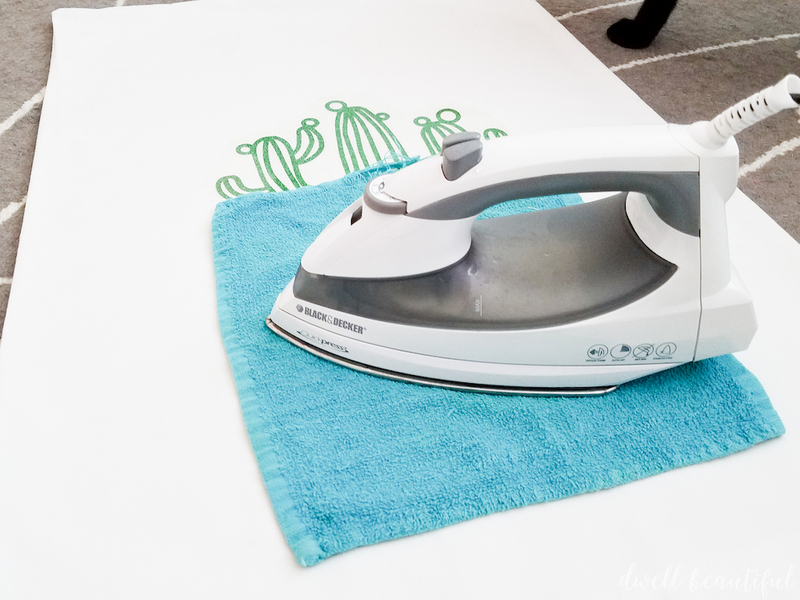 With my iron this takes several minutes – just keep at it! 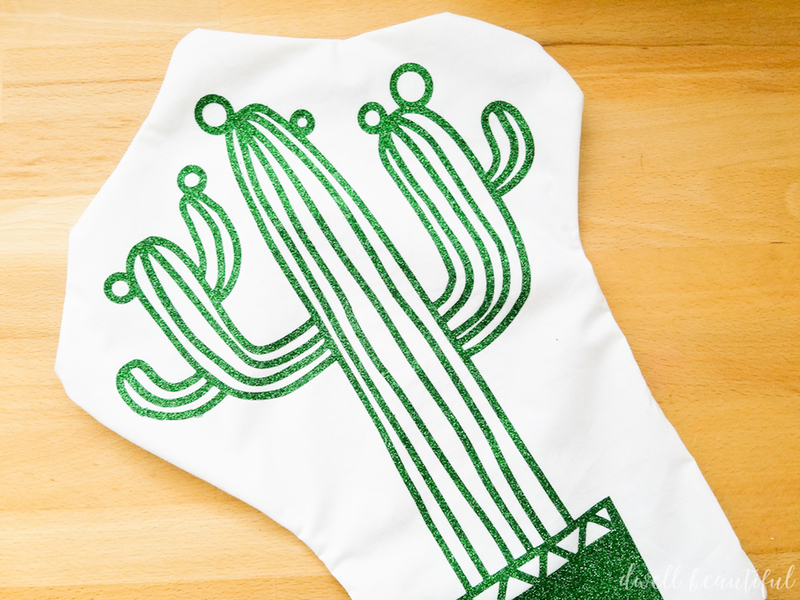 Once you’re confident it has been ironed on completely, remove the clear plastic sheet to reveal your adorable cactus design! 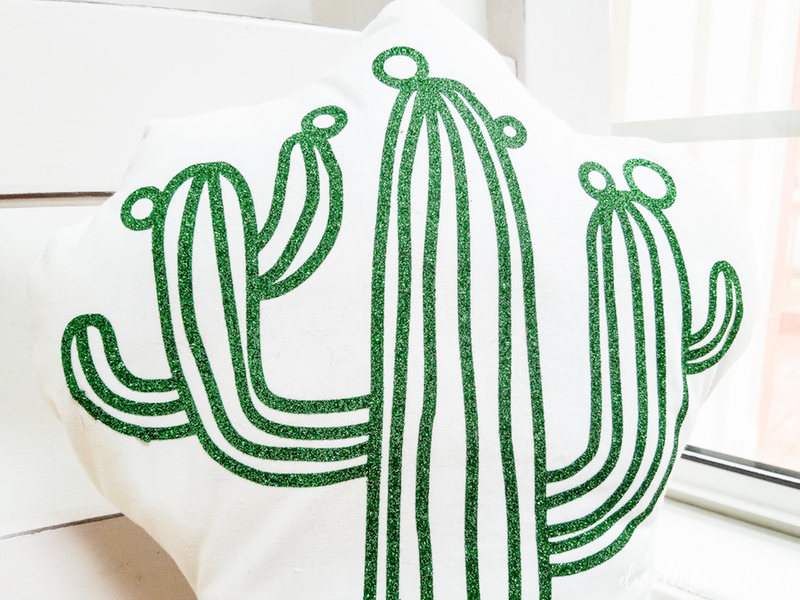 To make a fun-shaped pillow, cut around your design in a rough cactus shape. 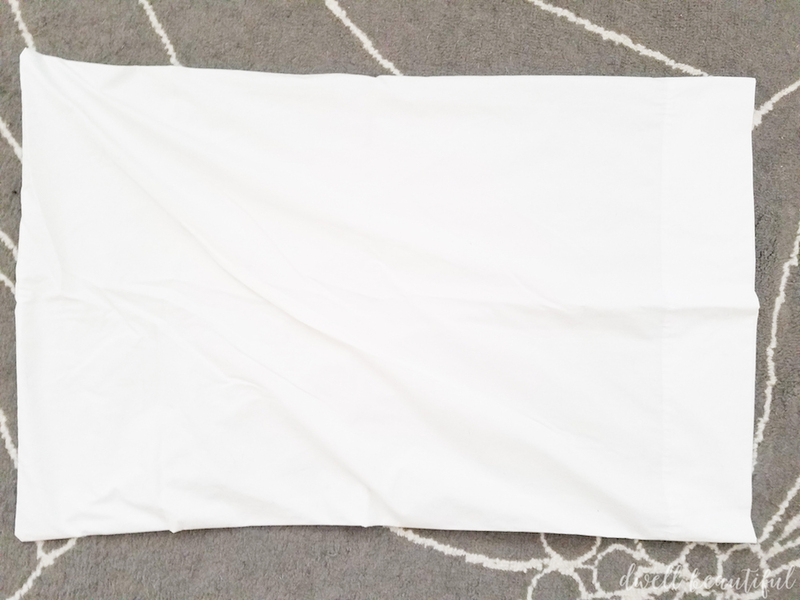 Cut a second piece that is the same shape out of the back side of the pillowcase. 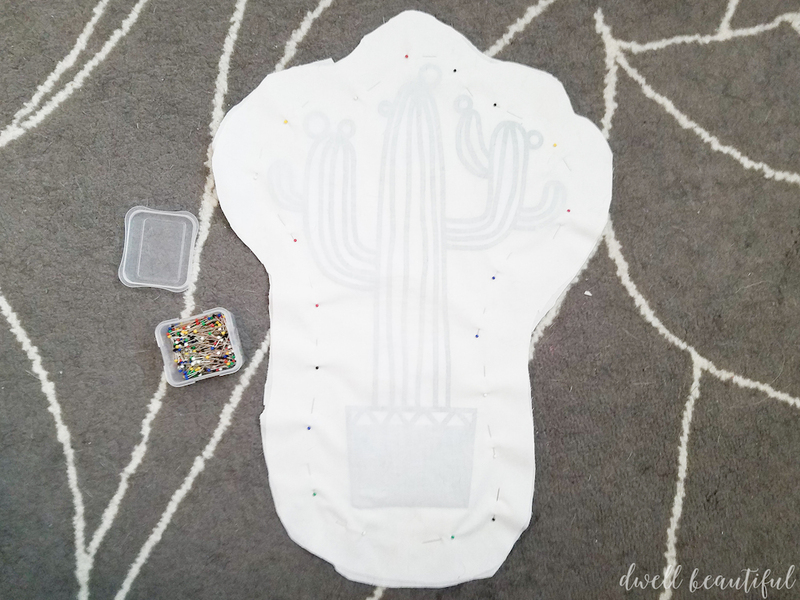 Face both pieces of pillowcase you cut out inward – with the sparkly cactus on the inside. Pin around the edge with sewing pins. 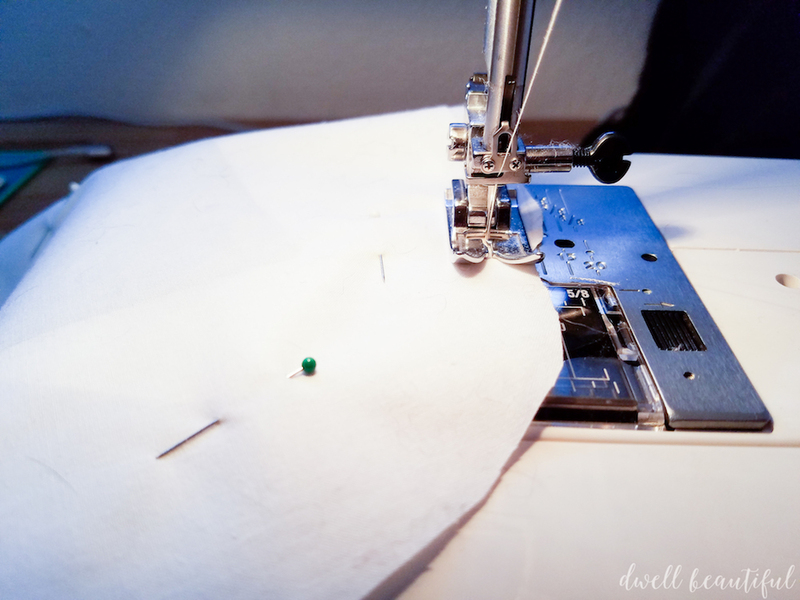 Using a sewing machine (or hand-stitching if you’re skilled like that!) Sew around the edge of your pillow, leaving an opening at the bottom. I used about 1/4 inch seam allowance all around the sides. Don’t forget to backstitch at the beginning and the end so it doesn’t come unraveled! Once you’ve finished sewing around the edges of your pillow, turn your case inside out so the glittery design is once more right side out. Using some fiber fill or fluff, stuff your pillowcase through the opening that you left at the bottom of the case. Use a pencil or marker to direct the fluff into the harder reach areas or tighter corners of your pillowcase! Once it’s stuffed to maximum fluffiness, hand-sew the opening shut and tie off. My favorite thing about this pillow is the sparkle – you all know I can’t resist anything glittery! I’m thinking about maybe adding a little scrap fabric rosette to this pillow so it looks like a cactus flower… what do you think? 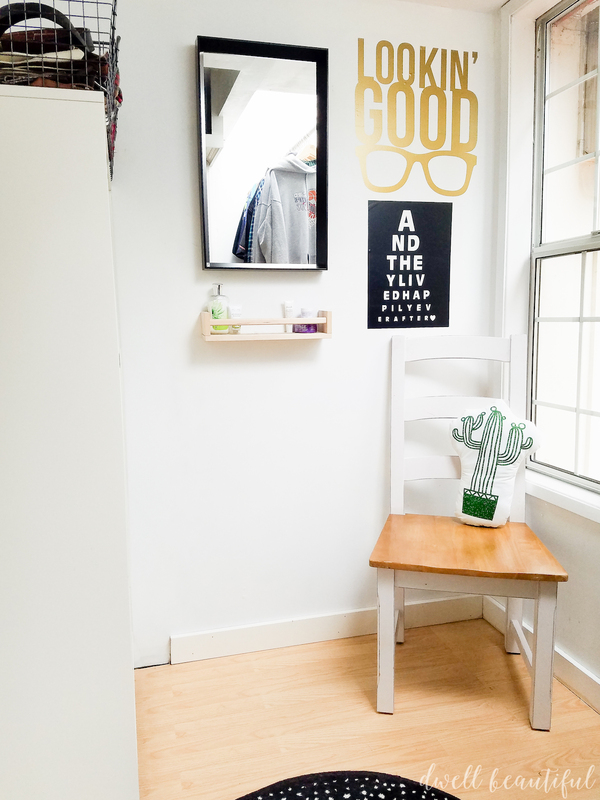 Cactus trend – do you love it or hate it? SO stinkin’ cute! LOVE it Erica! This is the cutest pillow, Erica! Thanks so much, Amy! It was a lot of fun to make! I LOOOOOVE this! The green glitter is so perfect for this cactus. Totally adorable, Erica! you are so cute. I LOVE this. Next Christmas I think I will definitely be getting a Cameo and following all your cute tutorials for making fun things. Thank you for signing me up. Can’t wait to get started with a project. I live where there’s cacti so maybe I’ll start there, wall hanging. Aw, thank you so much, Angie! We are glad you’re here! 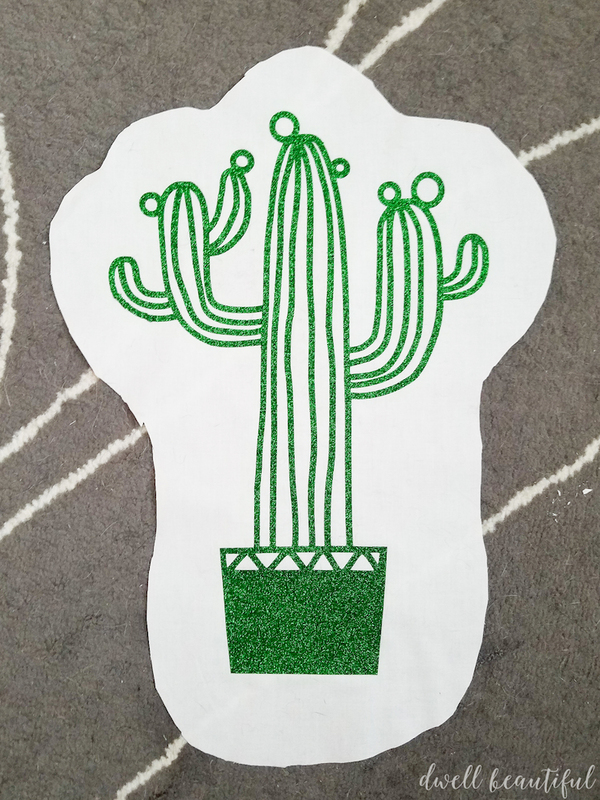 A cactus wall hanging would look so cute! Be sure to send me a pic when you finish so I can share it on social media 🙂 Thanks for stopping by!